Tangkuban Perahu (spell Tangkuban Parahu in the local Sundanese dialect) is a stratovolcano 30 km north of the city of Bandung, the provincial capital of West Java, Indonesia. 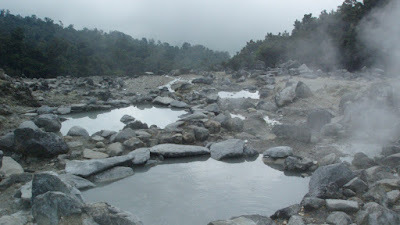 It is a popular tourist attraction where tourists can hike or ride to the Edge of the crater to view the hot water springs and boiling mud up close, and buy eggs cooked on the hot surface. 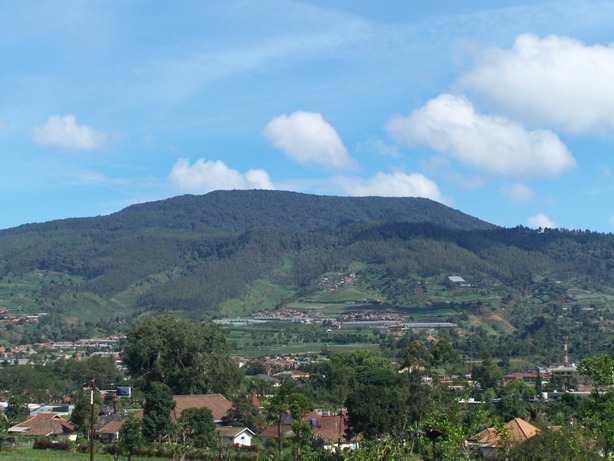 Together with Mount Burangrang and Bukit Tunggul, it is a remnant of the ancient Mount Sunda after the plinian eruption caused the Caldera to collapse. 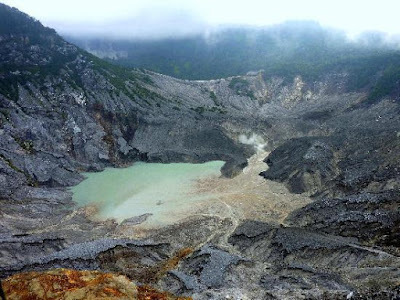 Like most mountains in Indonesia that have folklore passed down from generation to generation, Mount Tangkuban Perahu also has a story that is believed to be the origin of this mountain formation. The story of Sangkuriang and Dayang Sumbi is certainly familiar to most people. Told in the days of yore, lived a beautiful woman named Dayang Sumbi. Dayang Sumbi beauty is known by many people. Dayang Sumbi live together with his son named Sangkuriang in a jungle. Dayang Sumbi is very fond of Sangkuriang and they live happily with a beloved dog, the Tumang, who is actually the father of Sangkuriang. One day, Sangkuriang made a mistake. Sangkuriang went hunting deer with the Tumang. Until the afternoon, Sangkuriang did not get any deer. Sangkuriang is afraid to disappoint his mother. Finally, he decided to kill the Tumang and bring his meat home. At home, Dayang Sumbi immediately cook the meat that his son brought home. After eating, then he realized the absence of the Tumang. Sangkuriang finally confessed that the meat they ate was Tumang. Dayang Sumbi is incredibly angry at Sangkuriang. He tossed a stone up to his son's head and threw him away. Dayang Sumbi later regrets having expelled his beloved child. Then he prayed to be given a long and ageless life in order to meet his son again. After several years, they both meet again. Dayang Sumbi is young and more beautiful, while Sangkuriang has grown up and handsome. Long story short, they both fall in love. One day, Sangkuriang said he wanted to marry Dayang Sumbi. At the same time, the woman saw a scar on Sangkuriang's head and realized that he was his long-gone child. Dayang Sumbi then look for ways to make them not married. After asking for clues, Dayang Sumbi then put a condition on Sangkuriang. The young man had to be able to make lakes and boats overnight so that the next day they could get around the lake together. Towards the morning, the lake and boat made Sangkuriang almost complete, Dayang Sumbi was worried and pray for the sun to rise soon. The prayer is granted, the sun rises and Sangkuriang has not succeeded in completing the boat. Angry, Sangkuriang then kicked the half-baked boat into the middle of the lake. The boat landed upside down. Boat that is then referred to as Mount Tangkuban Perahu. 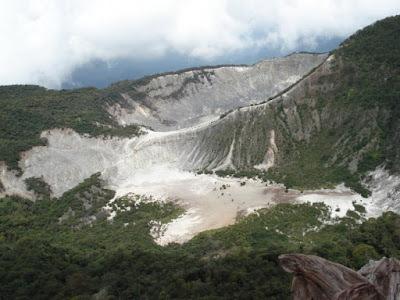 If viewed from a distance, Mount Tangkuban Perahu is shaped similar to the boat upside down. There are three craters that are frequently visited Aand very interesting for tourists, namely Kawah (crater) Ratu, Domas, and Upas. 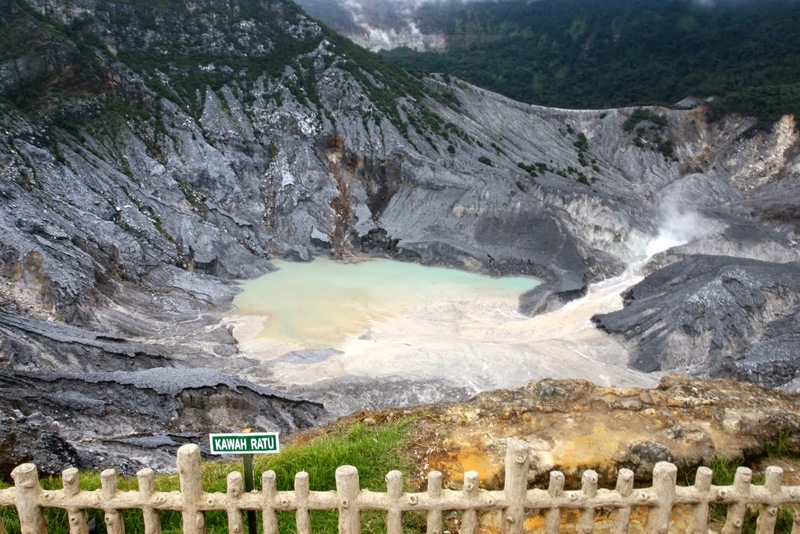 Ratu Crater is the largest crater of the three most famous craters on Mount Tangkuban Perahu. To get to this crater, you can use a private car or rental car in a location that will take you up to the crater. The road to the crater is not difficult, so many tourists come. Ratu Crater can be seen from the higher plains with wooden guardrails for the safety of tourists. Beautiful scenery you can see here. The soil around the crater is generally white with yellowish stones due to sulfur content. In addition, you can see smoke billowing from the crater. Around the location there are many small shops selling various souvenirs such as hats, scarves, gloves, masks and also wooden handicrafts. Not only souvenirs, there are also food stalls selling boiled noodles and hot tea or glutinous rice which is a typical food of Lembang. Domas crater is in the lower plains of the Ratu Crater. Unlike in the crater of the Queen who is only allowed to see from a distance and bounded wooden fence, in Kawah Domas, you can see more closely. In fact you can also test the heat of the crater by boiling the eggs here. Want to see exotic valleys and dead timber trees? Try coming to Upas Crater. Upas Crater is next to Ratu Crater. The road to this place is easy because there is no need to climb. But to reach it, you have to go through steep and sandy roads. Maybe this is what makes the number of tourists who visit here less when compared with the crater of the Queen. In addition, Upas Crater is also smaller and more shallow. - Exit the Pasteur toll gate leading to Dr. Djunjunan - Pasirkaliki - Sukajadi - Setiabudi - Lembang - Mount Tangkuban Perahu. - Exit the Padalarang toll gate towards Cimahi - turn left towards Jalan Kolonel Masturi - until T-junction of Lembang Highway, turn left - Mount Tangkuban Perahu. - From Terminal Leuwi Panjang (Bandung) - take a bus majoring Bandung-Indramayu - down at the junction of the gate of Mount Tangkuban Perahu. 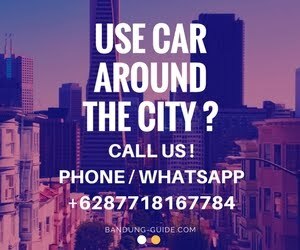 - From Hall Station (Bandung) - take an angkot (public transport minibus) majoring in Hall Station - Lembang - get off at the intersection (Lembang - Maribaya - Tangkuban Perahu) - take the angkot Lembang-Cikole - down at the edge of the crater of Mount Tangkuban Perahu.